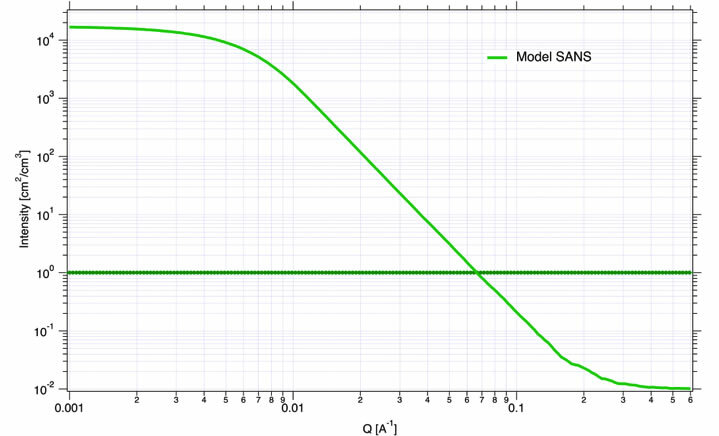 The use of small-angle X-ray and neutron scattering - SAXS/USAXS & SANS/USANS – can, for many problems, significantly advance the quality of materials characterization and therefore user research. 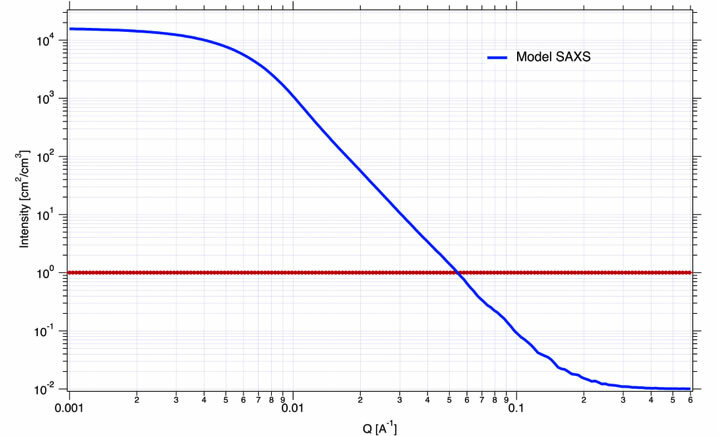 Sometimes the combined use of SAXS and SANS may be the only way to fully unravel complex microstructures (see model example at the end of this page). The application of multiple radiations can be viewed as ultimate contrast variation experiment - and it may even result in unique results not available from single radiation alone [e.g: Acta Materialia 57 (2009) 5571–5581]. Each radiation has its unique advantages, which may be necessary for many problems. However, sometimes old misconceptions in the small-angle scattering community provide a barrier to combined X-ray/neutron studies and are keeping the US scientific community from using these unique facilities to their full advantage. For example, high absorption of X-ray in the samples (requiring very thin samples) is much less challenging with the use of high X-ray energies up to 80 keV which are available at APS instruments. Similarly multiple scattering of X-rays, while present at these energies, is often much less of challenge than with lower energies. Even when present, a large scattering vector range of single scattering data can usually be recovered and used. And with typical SAXS exposures in seconds and USAXS exposure times are minutes or even less the productivity of SAXS experiments is very high today. On the neutron side, “hours long” SANS data collection times are not true anymore and on stronger scattering samples exposure times of 10-15 minutes are common. ???? Therefore the SAXS/SANS staff of the large US facilities is offering help to promote the SANS-SAXS combination use in the US scientific community through this initiative. Disclaimer: the beamtime at each facility needs to be obtained through the independent user access proposal system. Listed staff can provide help and coordination in finding appropriate instrumentation and contacts at their/other facilities as well as help users to apply for the beamtime, but has no ability to provide experimental time. Neutron users, requiring or considering combined use of the neutron and small-angle (and ultra-small-angle) X-ray scattering should contact one of the above listed experts and discuss their project with them. These experts can recommend instruments and facilitate contact with appropriate instrument scientists at each facility, as well as assist new users with application for beamtime if needed. To assist users allocated beamtime at US SANS/USANS facilities, the Advanced Photon Source beamlines 1-ID and 9ID are offering to make available beamtime through APS Rapid access proposals. The total amount of beamtime may vary each cycle (3 cycles/year) but 1-2 days is anticipated. 1-ID is a SAXS/WAXS instrument operated at 50-120 keV. A sample wheel which can accept up to 50 specimens has been designed and offered to users for these measurements (more details to follow). 9-ID is a USAXS/SAXS/WAXS instrument (http://usaxs.xray.aps.anl.gov ) operated typically between 18 – 24keV. It provides uniquely wide range of scattering vectors (0.0001 – 6 A-1) and has multiple sample holders for solid and liquid samples. For details on mail in samples holders see http://usaxs.xray.aps.anl.gov/docs/sample_holders/ . Since the data collection time on these instruments ranges from seconds to minutes per sample, many samples can be run in the course of a single day. 1. Users may need to submit Rapid access proposal (after prior agreement of the appropriate APS staff) through APS general user system or internal staff time may be used depending on the scope and safety issues. 2. This is mail-in program only - suitable for stable and generally safe samples for shipping, handling, and disposal. No on site sample processing/manipulation will be done by the staff. 3. Samples need to be shipped pre-mounted in acceptable sample holders (instructions provided by beamline contacts). 4. Sample thickness must be suitable for the beamline: 1-ID energy 50-80 keV, 9-ID 18-21 keV and sample size must be at least 2 x 2 mm or larger. APS staff will help users with any necessary calculations for sample thickness. 5. Support from neutron facility contact is required (see contacts above). Users with samples which do not fit in these conditions will need to apply for their own beamtime through APS general user system proposal to appropriate beamline as recommended by the above listed contacts. Imagine Al alloy (modeled here as pure aluminum) strengthened by addition of refractory ceramic nanomaterials – we selected powders of BC with 20nm mean size and Si3N4 powder with mean size of 30nm. Let’s assume spherical particles with Gaussian size distribution (width of the size distribution 10nm). Assume we add 3 volume % of each of the materials in the alloy and assume that the system is still dilute and can be treated as such. 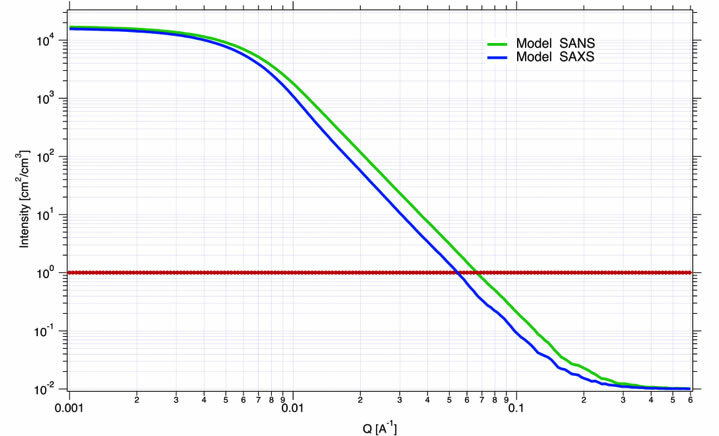 In order to be able to combine SANS and SAXS data, we need to put the data on absolute intensity scale, which is today common at all large facilities, for example using Glassy carbon absolute intensity standard or other similar methods. Therefore, while SAXS data are dominated by scattering from Si3N4 particles, SANS data contain both particle system scattering – and scattering from BC is actually stronger than Si3N4. Therefore, if SAXS/SANS data are collected on the same sample, they can be analyzed together (e.g., using Irena data analysis package) and both systems of scatterers can be properly and individually analyzed. Neither SAXS or SANS data on their own would provide enough information for analysis of this, relatively simple, system of just two populations of scatterers. Note, that the same sample of this fictitious Al material could be easily studied on both neutrons and X-rays – in this case ~1mm thick sample would be suitable for both SANS and SAXS. For example 1mm thick sample would have about 40% transmission on SAXS using 20keV X-ray radiation. Difference in sampled volume (SANS beam size is larger) can be easily solved by measurement and averaging of multiple locations over the sample area on SAXS.